There is so much of oneself that becomes invested in an effort such as this book, a story that in many respects I have been living a part of since I remember wrestling as a boy with my uncle, Archie, in my grandparent’s living room. His loss on 25 June 1952 was devastating to the family, and to me personally. It was as if I had lost my older brother. In fact, he was closer in age to me, his nephew, than he was to my father, his older brother. As you review Baited Trap, I know that we share a deep appreciation for the air rescue mission and those who fulfill it, then and now. I also know that when you finish the book, you will have an even greater appreciation for those pioneers of the air rescue service, such as Captain Wayne Lear and Master Sergeant Bobby Holloway–who flew daunting missions in rickety aircraft and created the new air rescue doctrine out of whole cloth. I thought that I should explain some of the “back story” of Baited Trap, events, objectives and how the story unwinds, of what happened that Wednesday afternoon on June 25, 1952—and afterwards. Because I grew up with Archie, I knew he was special—witty, mischievous, a leader and risk taker. He was exciting to be around. As I learned more about Wayne Lear and Ron Eaton, I was also impressed by their character, drive, professionalism and deep down “goodness,” if you will. The same is true of other principals in the story including Bobby Holloway and Elliot Ayer. The more I learned about them, the more that I wanted you to know about them. Baited Trap, the Ambush of Mission 1890 is, as the title notes, an incredible story of airmanship, bravery and dedication. It is even more the life story of the three airmen who were killed on that mission. I wanted you to know as much as possible about them—as well as what they did. Knowing them as you will, I knew that you would appreciate the rich and promising lives these young men had before them and that they put on line when they served their country in “defense of Freedom,” as it is called. And, once you knew Wayne and Ron and Archie, I felt certain that you would miss them almost as much as we who knew them in real life still do. I hoped that your sharing their loss would illustrate through the “human drama,” the real price of “defending Freedom,” including the bleak aftermath facing the devastated families they left behind—the “what might have beens” and the costs of lost opportunities represented by lives that were ended many decades too soon. You will find a great deal of imagery in Mission 1890—photographs, cartoons and memorabilia. Baited Trap includes not only photographs, of which there are hundreds, but also images that represent and illustrate important aspects of their lives–a letter of acceptance, a dog tag, a sports medal. I believe images help the reader share the look and feel and impact of the world lived by those we are attempting to bring back to life. Having lived the Baited Trap story in many ways, I knew the impact that Archie’s loss had on our family. I did not know or appreciate the extent of similar losses to the other families involved. I do now…and so will you. Most military histories focus on the mission, or perhaps those who flew it, as well. I have also tried to accomplish these worthy objectives in Baited Trap, because the mission and the units behind those who flew them truly made history. For the Third Air Rescue Squadron (3ARS), the 18th Fighter-Bomber Wing and the USAF, Mission 1890 was over on 25 June 1952. For the families, however, it will never be over. The “story” of Mission 1890 continues to this day. 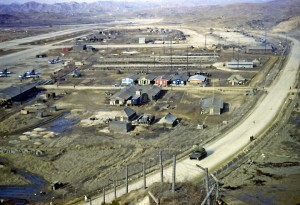 Long after the shooting on that North Korean plateau had ended, the families were caught up in the agonies and bleaknesses of the “missing in action, presumed alive” world—an empty life of hanging on to any shred of information, parsing every word of every sentence of every turgid letter from the “Bureau of Personnel,” writing letters of hope to other family members and trying to sound up beat and positive, even when all reasonable hope was a distant glimmer at the end of a bleak tunnel of dread. Baited Trap includes many letters to the families and from the officials dealing with status, personal effects and human remains. These letters constituted both a thread of hope and a bleak tunnel of dread for the families in the years following 1952. Some of the information included verges on repetitious. Some official information is erroneous. It is recounted in the book as it happened because that is how the “story” unfolded for the families—watching the mail box and dreading the telegrams, glued to the television news in the hope that a repatriated POW’s name might be familiar, or miracle of miracles, the one name above all you would want to see is there. That roller coaster of uncertainty, doubt and endless unanswered questions faced each of the families involved and is also part of the story. Slowly, as one set of hopes died, others would begin to grow, as Baited Trap recounts. Lives, however battered and broken, could be put back together. All of them tried—Della, Frankie, Dolly and Marguerite—not all were successful. The eventual toll for Mission 1890 was much greater than the three servicemen, as it turned out. That too, is part of the story. When it is necessary to send the fine young men and women of America’s military into harm’s way to defend Freedom, remember that for some, perhaps the bravest and the best, the price will be their lives, their futures. The real price will be the “cost of lost opportunity,” the “what might have beens,” for them and for many of their family and those they left behind to try and rebuild shattered lives. The price for the servicemen and women will be their lives and it will be paid at the time they are killed in action. The price for the families and loved ones is unknowable and endless. It continues from the day of the “I regret to inform you” telegram or notification until the last member of that family dies who knew and loved them. It continues for our country by its not benefiting from the lifetime of contributions to our society made by these outstanding individuals whose lives ended so prematurely. Thank you also for your personal investment in this incredible story. Once you have read Baited Trap, I hope you will agree with the Air Force general whose last letter to one of the widows created by that heroic mission assured her that her husband’s sacrifice would “long be remembered by a grateful Nation.” This book is to ensure that our Nation does long remember, with gratitude, Wayne and Archie and Ron, and all the other servicemen and women whose defense of Freedom has cost them their lives. It was nearly dark at 1915 hours on 25 July 1952, when Captain Elliott Dean Ayer, Flight Leader of Filter How Flight was “wheels up” from K-46, Hoengsong, SK, on a twilight reconnaissance of a North Korean MSR. K-46 Forward Operating Base for the 18th Fighter-Bomber Wing, 1952-53. It was rapidly getting dark, making it harder for ground observers to make out the “655” side number or the “Lovely Lady” on the left cowling or “Lady Louise” on the right cowling. His four-ship flight included 1st Lt. William McShane flying Number Two, 1st Lt. C. J. Gossett was Number Three, and 1st Lt. Rexford R. Baldwin was Number Four. Ayer was one of the Korean War’s most experienced pilots and leaders, having served with distinction as a soldier, NCO and combat pilot during WWII. He was highly experienced in the F-51 Mustang, having earned several decorations for his bravery during heavy air combat in the Italian theater in WWII. Following his appointment as How Flight Leader of the 67th Fighter-Bomber Squadron on 1 June just a few weeks before, he had been selected by the 18th FB Wing to fly its historic 45,000th combat mission, a great personal honor. 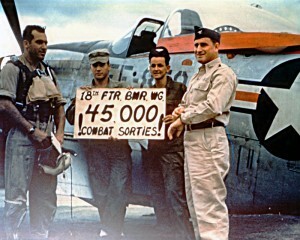 Captain Elliot Dean Ayer, USAF (left) is congratulated by Colonel Sheldon Brinson, Commander of the 18th Fighter-Bomber Group (the combat flying squadrons of the 18th Wing), after flying the Wing’s 45,000th combat mission on July 14, 1952. He was killed in action two weeks later.